The Women in the Winner’s Circle Project Podium Grant is now accepting applications. This grant provides direct financial assistance in the form of matching grants to women in racing to help further their professional careers. The Project Podium Grant process introduces or further provides experience for drivers related to the very important business aspect of the racing industry. Read the guidelines and apply today! Deadline to apply is October 31, 2017. For additional details, please visit the Women’s Sports Foundation website. The overarching goal of the Women’s Sports Foundation Women in the Winner’s Circle Project Podium Grant is to provide direct financial assistance in the form of matching grants to women in racing to help further their professional careers. The Women’s Sports Foundation Women in the Winner’s Circle Project Podium Grant is a matching funds program focused on young women in racing who have demonstrated talent, hard work and perseverance with successful competitive records, who have the potential to achieve even higher levels of performance and the ability to generate sponsorship dollars to achieve racing and business success. The Women’s Sports Foundation Women in the Winner’s Circle Project Podium Grant process provides experience for drivers on the very important business aspect of the racing industry by the matching fund requirement. 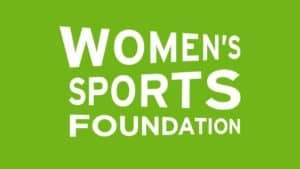 What is the vision of the Women’s Sports Foundation Women in the Winner’s Circle Project Podium Grant? Empower drivers with ability to generate financial resources to grow and sustain their racing careers. Who will administer the grant? In addition to Lyn St. James, a panel of motorsports experts and business professionals selects each recipient from a list of qualified applicants. 1. Provide proof that funds equal to the funding amount requested have been raised from sponsorship or other forms of support for her racing for the specific racing series and season identified. 2. Have a minimum of three years of racing experience. 3. Complete the Women’s Sports Foundation Project Podium Online Grant application. You will need to register with the Foundation’s grant-management system to access the application. Under the organization information, please enter the information for your Team. A Tax ID number is not required to register (so you may leave that space blank). 9. Promote Women’s Sports Foundation through logos, inclusion in media materials and interviews. 7. Grantees will be required to display a Women’s Sports Foundation mark (logo) and Project Podium patch on their race suit and/or helmet and decals on race vehicle and support equipment (location TBD) as well as include information regarding the grant in press and marketing materials, including websites. How many grants are awarded and for what amount(s)? The number of grant(s) shall depend on the number of qualified applications received and the amount of funding available annually. What are the deadlines and other relevant dates? The 2018 application window is from August 1 through October 31. Applicants will be notified by November 30th and the 2018 grants will be awarded the first quarter of 2018. A strong advocate for women in the motorsports industry, particularly women who aspire to the professional level in racing, Lyn St. James established the Women in the Winner’s Circle Foundation (WWCF) in 1994 as a 501(c) (3) non-profit organization dedicated to professional development for talented, up-and-coming young women in racing. One of the Women in the Winner’s Circle Foundation’s programs was the Women in the Winner’s Circle Academy: The Complete Driver. The Academy became the most comprehensive educational and training program of its kind for gifted women racers providing the skills on the track and off the track to be competitive in motor sports. Since its inception, more than 230 women drivers from 5 countries and 33 states, including Danica Patrick, Erin Crocker, Melanie Troxel and Sarah Fisher, have participated in this invitation-only Academy. Building on the success of this continuing program, St. James felt it was important to provide financial resources to these talented drivers as well as training. In 2007, Women in the Winner’s Circle Foundation announced the first ever scholarship fund for women race car drivers, Project Podium, with a donation from Paul Newman’s Newman’s Own Foundation. Since then, this industry wide scholarship fund has been available to female race car drivers from all forms of racing, including go kart, quarter midget, drag racing, sports car racing, oval track racing, etc. For a driver to be considered eligible to receive a grant, they must have had a minimum of 3 years of racing experience, and they need to provide proof that funds equal to the scholarship amount requested has been raised from sponsorship or other forms of support. Those who apply, qualify, and are approved will receive a grant on a matched fund basis only. One goal behind this program is to help teach drivers how to raise sponsorship funds. 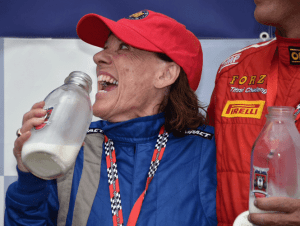 In 2013, the Women in the Winner’s Circle Foundation combined resources with the Women’s Sports Foundation to establish the Women’s Sports Foundation Women in the Winner’s Circle Project Podium Grant for women in motorsports. All applications will be reviewed by a panel of motorsports experts under the leadership of Lyn St. James.